With regards to log scales, what’s more important than the general idea that small changes in log values reflect large changes in raw values (e.g., the 0.51 difference between Iraq and Pakistan corresponds to a raw-score difference of 5667) is the fact that a fixed change in log scores reflects different changes in raw values, depending on where you are on the scale (e.g., the [very similar] 0.52 difference between Afghanistan and India corresponds to a raw-score difference of only 2362). On the surface, one might look at this and wonder what people are trying to hide by using a log scale. After all, such scales do a good job of concealing huge problems from those who have no experience with what the large values would imply for every-day life. But the use of a log scale could just as easily be motivated by either statistical or psychological reasons. First, if the raw data correspond to rates (or proportions), then logging is entirely appropriate statistically, as it will convert a hugely-skewed distribution to something closer to Normal. Second, as we have known since the 18th C, human perception of external magnitudes is roughly logarithmic (i.e., it obeys Weber’s Law). None of this undermines your basic point, of course. I just needed to release my inner nerd (and/or stats teacher) while I drank my coffee. @JTMinIA: No problem. The reminder that where we are on the scale means a lot for how raw numbers change with changes in the log score is an important one. Thanks. @Jim White: Interesting statistical observation but subject, of course, to the Unifying Theory of “where ever you go, there you are.” And the question then becomes how this report feathers into interpretation not of “terra” generally, but the United States’ “War on Terra” specifically. If this report is a “scorecard”, it reflects that the units of measure are almost wholly outside the boundaries of the game the US has been playing. If this report is compared to stated or inferred US goals of eliminating US fear of attack by Islamic terrorists, then the war is certainly virtually over and the US “won” on points, if not by knockout — cue Jeh Johnson, declare “victory” and revisit the presumptions of dire imminent threat of mass US slaughter that have fed the lawlessly militaristic adventures of our past decade and let’s get on with the task of leading lives in which illegal activities are treated as criminal matters. We could stop claiming the need and the right to act as the Baddest Rogue State any time now. If this report also might be read as a survey of acts of terror affecting countries other than the US for reasons largely driven by historically religious or regional disputes — possibly exacerbated by political turmoil including but not limited to democratic revolution and/or military decimation of pre-existing political orders by US/”coalition” interventions — then maybe those are different considerations than the ones purporting to fuel the US’s last decade of GWOT tactics and might be assessed independently and to different conclusions. Or not. Maybe it’s just a chart showing there’s “still Terra” so we need to apply more US technology and less US restraint or respect for priniciples of international and American law. Really? @JohnT: Sometimes, maybe, conventional wisdom is neither. But it’s predictable, gotta say that much for it. Shall we all move along? 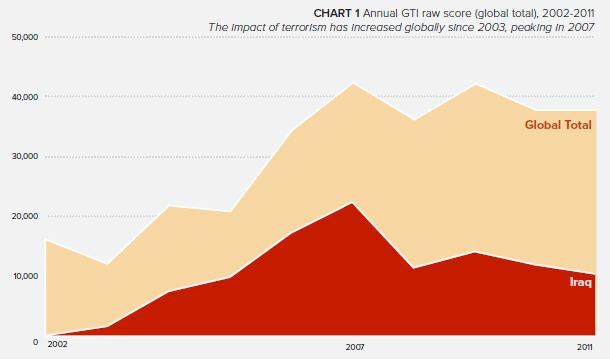 U.S. war on terrorism is a wild success. It’s objective is to create more terrorism. Analogous the the War on Drugs, also wildly successful.